Flopsie and Mopsie are two brothers from the same litter. 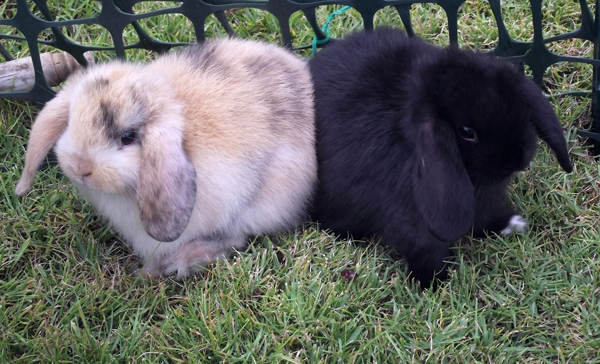 Flopsie, the brown/white one, looks like his father. Mopsie, the black one (with one white front paw), looks like his mother. They were “adopted” by us in April 2010 and live in our backyard in Ewa Beach, Hawaii. When they were babies, they were kept in a large cage but quickly outgrew it, and now have the run of the backyard, terrorizing no one, not even the doves who eat their pellets at will, or the toad that occasionally sits in their water dish at night as if it were a hot tub. They quickly ate the ground cover and herbs that were under the bushes, showing no inclination to eat any weeds. Fortunately they leave the grass alone, preferring the fresh kale and other vegetables their foolish owners buy them every week. Their favorite treat is raisins and they are shameless in begging for them: licking the screen door until someone looks down to take pity on them. Since they look so different, it’s no surprise that their personalities are also different. Mopsie is smart and quick, always with an eye out for a raisin donor or danger, and sometimes thumping his hind feet in alarm. Flopsie is slower, carefree, and seemingly oblivious to his brother’s thumps. Although they made frequent escapes from the backyard during their first year, they seem to have settled down, realizing that the grass is not always greener on the other side—knock on wood! For more about them, visit their “Tales” page. Contact them (and their “mom”) at: backyardbunshi@gmail.com.